Are you aware of the castle built by Ignatz Oechsner in Williamsville, NY? The castle is located off Oakgrove Drive in Williamsville, NY. The Buffalo News and the now defunct Courier Express newspapers have written many articles on the castle. The family has often disagreed with the paper's accounts citing lack of accuracy. Apparently, Ignatz was a castle builder in Germany before he immigrated to the USA. He and his family once owned a great deal of Williamsville, where they quarried the local rock for sale to building companies. The Castle in Williamsville is a small one. It happens to be on property located behind my old piano teacher, Mrs. Adema's house on Oakgrove. It lies right next to the creek (Ellicott?) that runs through the village. I once had a picture but I don't have it anymore. It was used for an independent film that was filmed in the Buffalo area though but I don't know the name. It was years ago. Ignatz Oechsner was a mason who once lived in Oxenforte (Ochenfurt?) Germany. When he came here, he decided to build a castle which he started in 1917. The castle was built on a one acre island in Ellicott Creek called Dream Island. The island is located about four blocks south of Main Street. The castle was built of fossil rock brought in from Holland, New York. 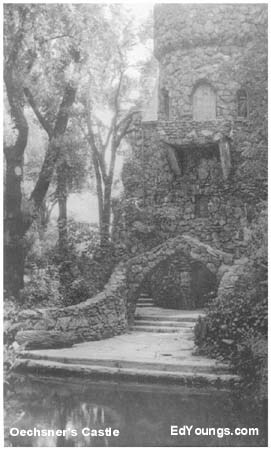 Mr. Oechsner worked on the castle for 25 years, but did not have it finished by the time he died in 1942 (1943?). Included in the project were a main building, gatehouse, tower, dungeon, and a coach house. The Duffney family lived in the castle until about 1950. In 1956, fire destroyed the castle as it was about to be purchased by Mr. and Mrs. Davis. Mrs. Davis was not about to let this fine building die, and she worked hard to find a way to have it restored. She accomplished this goal, and thanks to her and her husband, the castle is still in existance. The castles present occupants are Mildred O'Rork and Analey Davies. There is some confusion regarding some of the details about this castle. If you have more information, please pass it along. We were in Buffalo, N.Y. this past weekend and on Route 5 which goes into Williamsville, so we decided to check out this castle. I was wondering if it still existed, because the only driveway that it seemed it could have been had “No Trespassing” signs on one side of the drive and "Private Property" on the other. The address at the end of the drive was 193 Oakgrove Drive. We didn't get to see anything, but it seemed interesting enough from your site info to at least try to check it out. Thank you for your time. The castle is modeled after a castle in Germany (Oxenford I believe was the name) and has many special little touches, such as the trademark ox over the door, and lions over the windows, there are downspouts with gargoyles and dragons and wonderful statuary all about the property. I had heard many stories of the castle as a little girl, but had never seen it or known where it was...until we had moved onto the street and had we not heard from one of our neighbors that it was there, we would have ever known... it is indeed hidden well. I can assume in the fall & winter it is much more visible from the street... if you park up the road from the end of the driveway and look across the water to the left, you will see the refection of the bridge and from there it will be easier to pick out the rest of the castle behind the cover of trees...the main gate and guard house, along the water you will see the black iron and stone gate to the gardens, the Main castle tower covered in Wisteria, and perhaps even the outdoor fireplace and the large dragon which had fallen from the main house in the fire. next to the main house There is a "communication tower" complete with kitchen and lavatory (it was really used for carrier pigeons in it's earlier days! )and later became a playhouse for Mrs. Davis' children, there were few telephones in the village at that time, so Mrs. Davis had a phone line & telephone installed on a tree in the yard, she conducted much of her business fromthe tree. There is a carriage house, a "dungeon", wonderful bridges, an elevated guard house complete with fireplace, there are ponds with Millie's goldfish and gardens full of statuary. Mr.& Mrs. Davis put a lot of love into the property, and even illness could not keep either of them from fulfilling their dream of restoring it to it's original splendor. Mrs. Davis was often found at the library finding ways to engineer her dream into a reality. Mr. Davis would painstakingly plant each and every plant in the many gardens, even after a crippling accident. The children diligently helped in any way they could. It is very sad to say that the castle has fallen victim to vandalism and theft over the years, so many of the original pieces were either stolen or destroyed in the fire, but the castle still stands in all of it's grandeur. There is a "secret" room which was turned into a child's play area, the Davis' children's mini kitchen is still intact and my children enjoy going over and playing "house". At one time the water danced from the top of the ceiling to the floor,in a grotto style waterfall. there are large rounded windows to let the sunlight in...inside the castle there is the same stone work as there is on the outside...it is absolutely beautiful. I hope this sheds some light on the details of the property, I know the Davis children are very proud of their parents for raising the castle from the ashes...It would have been demolished had they not stepped in to resurrect this monument. It would be a shame to see such a fine historical building lay to waste. You may be interested in posting this to your site. This castle is "under attack". The owner/occupants are two lovely ladies in their 80's. The castle is on an island in the middle of a wealthy suburb. At night, people are coming down the creek in boats with tools, disassembling parts of the stonework, and boating it back out. This is a big operation, so no doubt the stone is being sold for construction and or rebuilding offsite. There is a considerable amount of stonework on the island, and many of the little things (benches, fountains, low walls) have been completely removed. The police know about this but have been unable/unwilling to do anything: they'd really need to put boats in the water, above and below the castle, in the dark, when someone is committing the crime - so their lack of effort is somewhat understandable. Instead they just drive up and flash their lights. If this is true, what a terrible situation. Does anyone know more about this? Is there anything that can be done to stop these thieves? I thought you'd be interested to know that Oechsner/Cambria Castle in Williamsville, NY held an estate sale last month that attracted basically the entire area. Several more pictures and much more information is available now thanks to the sale. It may be up for sale itself soon; a huge undertaking for the buyer but one with so much potential. I grew up loving this castle and much of my information on it came from your site so I thought it fair you should know the recent developments. Thanks to Thomas W Young for sending the first photo and information. 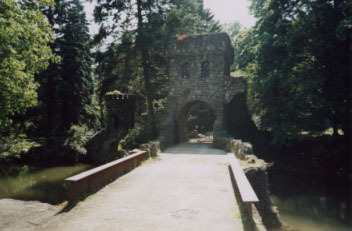 Second photo - Oechsner Castle Gatehouse Copyright 2001, Robert W. Harney.